Located at beautiful Lake Kingsley in Lakeville, campers ages 4 through 15 engage in small-group structured activities with other campers in their age group. They learn new skills and build self-esteem while being guided by the YMCA’s core values of caring, honesty, respect and responsibility. Your child can have an amazing outdoor experience this summer and sleep at home, too. 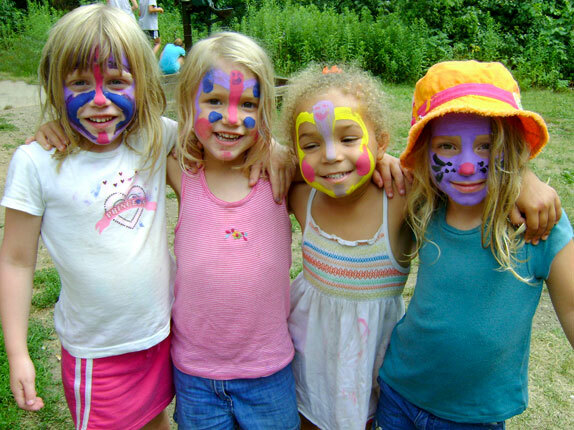 Outdoor fun and adventures abound at YMCA Camp Streefland. Campers’ weeks are chock full of exciting, structured activities sure to interest both new and returning campers. And we've expanded our bus stops so more kids can join in the fun. To mark their camp accomplishments and treasured experiences, every camper is awarded special beads to display in the camper’s unique style. Choose fun, choose friends, choose day camping and get plenty of memories to last ‘till next year. See YOU at Camp Streefland. Hope to see you this summer! Office Hours: 7:30 a.m. – 5:30 p.m. The High and Low Ropes Challenge Courses add even more challenge and excitement for campers. And campers get a real thrill from the “Black Hole” slide! This ultra-huge tube slide runs down a large hill and kids take their turn for a fast and thrilling ride on a plastic snow sled that zips through the tube down to the base of the hill. Whoopie! What a blast! There’s more! There are many specialty programs for every camper. Camp Streefland’s Adventure Island, where older campers try their skill at Target Sports, is a bull’s-eye hit! Campers can also choose Horse Camp, Theater Camp, Arts & Crafts Camp, Climbing Camp, Junior Angler Fishing Camp, Teen Quest, Leaders-in-Training, Outdoor Living Skills, and Extreme Adventure Camp.